SKU: WS284-AS. Categories: Funny Signs, Novelty Signs, Warning Signs. Tags: Psycho, Warning Sign. 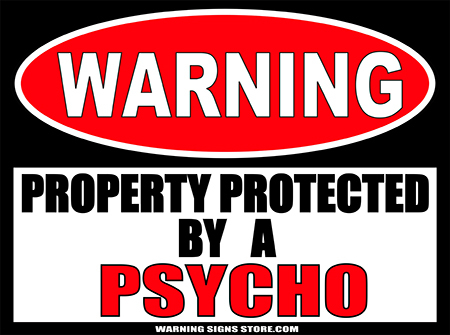 If you want to protect your property, a Psycho may not be the first choice for most people but that’s what makes you so unique! Psychos can do what it takes to protect your property without those pesky things most of us feel– things like guilt, remorse, mercy. They’ll lure pontential intruders in with their glib charm and manipulative cunning– then they’ll move in for the kill. The Spider and the Fly, a poem by Mary Howitt (1829) could well describe your Psycho. And like the Fly tells the spider, – who goes up your winding stair can ne’er come down again. 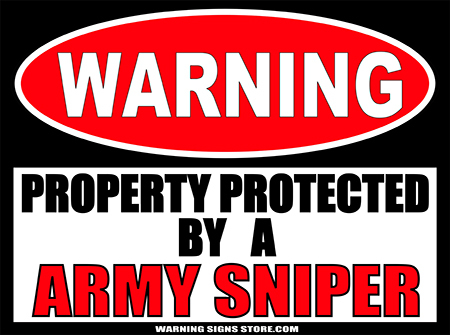 Warn people that you have a Psycho on premises.. or that you are the psycho… with our effective warning sign. This sign measures out to approximately 9″x12″. It is printed in a glossy finish with eco-friendly inks on a premium vinyl polymer and backed with 0.040 gauge aluminum. Our inks are UV resistant and designed to last 7-10 years, indoors or out. Aluminum has 2 pre-drilled holes for mounting and has rounded corners for your protection.